China’s Ctrip, Asia’s largest online travel agency, recently signed strategic deals with Italian authorities, airports, railways, museums and destinations to prompt more Chinese high-end tourists to visit Italy, as Rome and Beijing are getting their relations boosted at the first official visit of Chinese President Xi Jinping in the country. “Ctrip will expand international cooperation with Italian partners and is ready to be the ‘Marco Polo’ of the new era, acting as a bridge of cultural exchange between Italy and China” said Jane Jie Sun, CEO of Ctrip. Ctrip is China’s top travel service provider with 300 million users. Ctrip signed a strategic arrangement with the Italian National Tourism Board (ENIT), as well as cooperation agreements with the Italian industry, including Airports of Rome (ADR), Italian railway Trenitalia, Ferrari Museums, Airports of Milan (SEA), and a series of Italian destinations and businesses associations, including the Region of Tuscany, the Region of Umbria, the municipality of Rome (Roma Capitale) Rome and Lazio Convention Bureau, Fiavet, Federturismo and Unindustria on March 22, a move viewed as a milestone for Italy-China tourism cooperation. 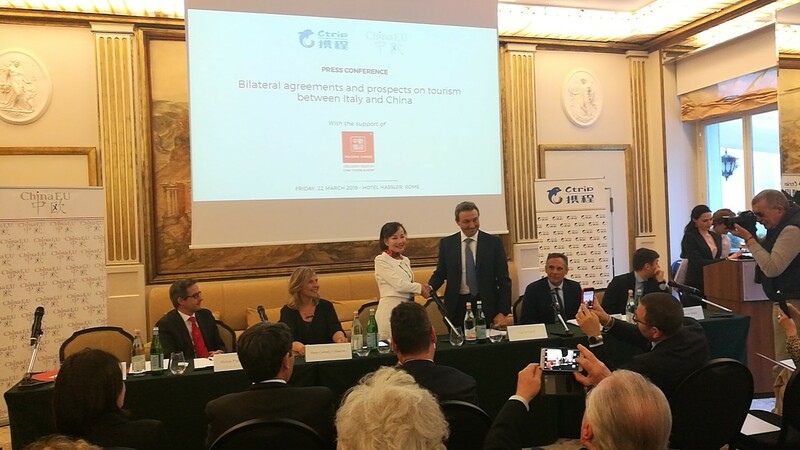 Through the strategic arrangement with Ctrip, ENIT, which is in charge of promoting the unitary image of the Italian tourist offer in International markets, wants to have more high-end, knowledgeable Chinese tourists to explore, visit and spend in the country, pointed out Giorgio Palmucci, President of ENIT. The deal was inked by Jane Jie Sun and Counselor Luigi Fiorentino, Head of Cabinet of the Italian Ministry of Agricultural, Food, Forestry and Tourism Policies, following a bilateral meeting between Minister Centinaio and Chinese Minister of Culture and Tourism Luo Shugang. Italy and China decided to set 2020 as the year of Italy-China culture and tourism during Xi’s visit amid a ballooning Chinese outbound tourism market and Chinese visitors’ increasing interest in Europe. Speaking at the second assembly of the Italy-China Cultural Forum held on the same day, Minister Centinaio called for a concrete program of valid initiatives throughout the territory through a renewed role of ENIT and through the engagement of the cultural institutions, the creative industries and the tourist operators of the two countries. Last year, China’s mainland travelers registered 149.72 million outbound visits, up 14.7 percent from the previous year, according to the China’s Ministry of Culture and Tourism. More and more Chinese visit Italy in recent years with the number reportedly hitting a record of 1.8 million in 2018. Xi’s historical visit to Italy, the first presidential state visit in ten years and the first leg of Xi’s first overseas tour this year, is expected to greatly capture Chinese travelers’ attention and stimulate visits in the aftermath. As to Italy, tourism shores up some 13 percent of Italian GDP in 2017 and Chinese buyers consumed roughly one-third of Italy’s luxury goods. “Italy was the destination of the ancient Silk Road and it is an important member of the Belt and Road Initiative- our cooperation will better unleash the potential of both tourism industries, create more jobs and bring more economic benefits,” Sun told a press conference on March 22 at Hassler Hotel in Rome. The press conference on bilateral agreements and prospects on tourism between Italy and China held at Hassler Hotel in Rome, on March 22. Airports of Rome (ADR), Trenitalia and Ferrari Museums are already members of the Welcome Chinese program- the China Tourism Academy-issued certification, dedicated to the hospitality of Chinese travelers overseas. Through cooperation with Ctrip, the three Italian flagships aim to further increase visibility in China, the world’s largest source of outbound tourists. It is fundamental that Italy does not miss the opportunity of Chinese outbound tourism, said Damiano De Marchi, Senior Researcher at CISET– the International Center of Studies on Tourism Economics, funded by Venice University and Veneto Region. He pointed out both the number and expenditure of Chinese visitors have seen growth: more than 5 million nights spent, with a double digital average annual growth rate of 17%, and an average daily expenditure of 167 euros in 2017. Ctrip is Asia’s largest online travel agency, a Travel industry giant, with revenues of USD 88 billion (2017), 300 million registered users and market capitalization of USD 25 billion (Ctrip is on NASDAQ [CTRP] since 2003).